These are the ten players in NBA history with the highest all time free throw percentage. This is an interesting list filled with great players. The list is fluid as active player Stephen Curry is on the list in a high spot. Two active NBA greats who are playing this season just miss making this list. Kevin Durant currently has a career free throw percentage of .882 which ranks 14th best all-time, while Dirk Nowitzki is at .878 which ranks 15th. Those are deadly high percentages for two players who get to the free throw line all the time. 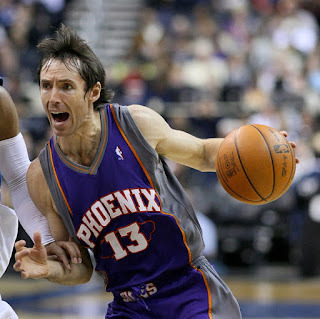 Steve Nash is currently the all time best free throw shooter by percentage at .9043. Nash has led the league twice in free throw percentage and shot over 90% from the line nine times in his career. Nash is out this season with a bad back and is unlikely to ever play in the NBA again so his .9043 free-throw percentage will likely be his career average and likely stand for a longtime as the best in NBA history. Mark Price was a decent point guard in the NBA from 1987 to 1998 and was always known for his free throw accuracy. He led the league in free throw percentage three times, including back-to-back in 1992 and 1993 when he shot .947 and .948 respectively. No shock to see active player Steph Curry on this list as he is a great all-around shooter. Rick Barry is one of the most famous free throw shooters in NBA and basketball history as he shot his free throws underhanded. Rick Barry is the fourth best free throw percentage shooter of all time at .900. Barry led the NBA six times in free throw percentage and also led the ABA once. Rick Barry was pretty much a jerk during most of his career but he could score and led the NBA in scoring in 1967 with a 35.6 points per game average. Peja Stojakovic led the NBA twice in free throw percentage in his career. Despite never leading the league in the category, Chauncey Billups is the fifth best free throw percentage shooter in NBA history. Is anybody surprised that the NBA all time leader in most 3-pointers is also one of the best free throw shooters of all time? Allen has never led the league in free throw percentage but did shoot .952 from the line in 2009 (Jose Calderon made 151 of 154 free throws that season which is the best percentage for a season all time). Calvin Murphy led the league in free throw percentage twice in his hall of fame career. Scott Skiles never led the league in free throw percentage but he did once dish out 30 assists in a game which is the most assists ever in an NBA game by a player. Reggie Miller led the NBA in free throw percentage four times in his career. Larry Bird led the NBA in free throw percentage four times in his great career. I was never a Boston Celtics fan or a fan of Indiana State but I always liked to watch Larry Bird play because he played the game with such confidence. How many people today are like me and know the nickname of Indiana State University is the Sycamores solely because Larry Bird played there? I can still remember Bird's sidekick at Indiana State was guard Carl Nicks and Magic Johnson's alley-oop sidekick at Michigan State was Greg Kelser.